This Psalter is named after one of its owners, John Grandisson, who was bishop of Exeter from 1327 until his death in 1369. It was adapted for his use, having originally been made for someone who perhaps lived in the area of Chichester. 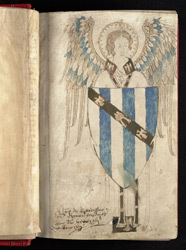 This angel, wearing and holding the arms of John Grandisson, was added to the manuscript when it was in his possession. The inscription recording his ownership, in the lower left-hand corner, was added after his death.